There are as many types of wood as there are types of trees, each with characteristic grain, hardness and color. Here’s a short list of the most common types of wood used for floors or furniture. By far, red oak is the most popular flooring option, with warm pink tones and a rich, grainy appearance which works well with most stains. White oak is harder than red oak, is naturally a wheat-like yellow color, and has a lovely grain of warm medullar rays. A traditional flooring wood famous for its traditional and cozy warmth, pine flooring is found in numerous historical homes. Pine is a soft wood, and given to showing ‘dent’ marks after prolonged use under heavy furniture. 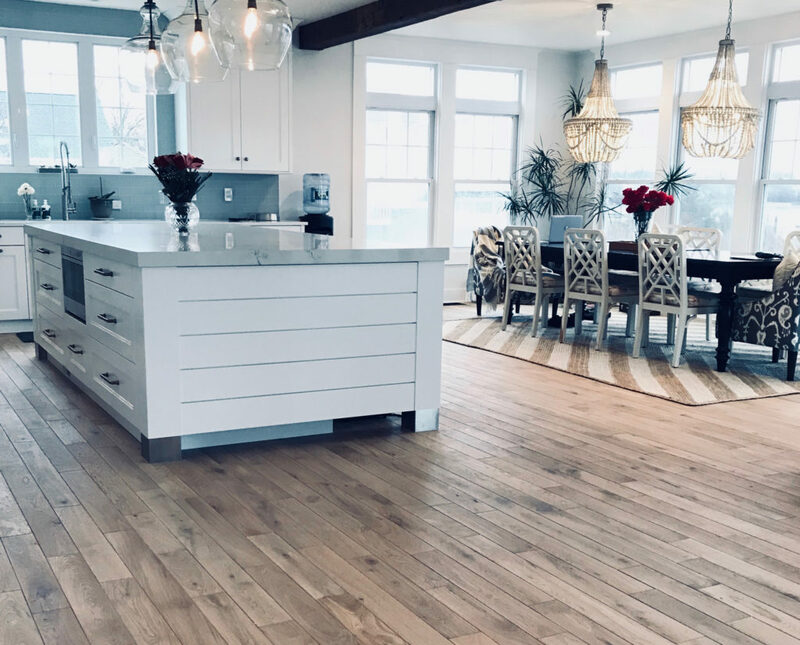 For this reason, pine floors are a popular choice with new home builders who want a floor with hand-distressed, or ‘rustic’ details. A clean-looking hardwood, less textured than oak, offering a uniform appearance with exceedingly fine graining. Maple is an extremely popular wood for home flooring. A beautiful pink-toned wood which takes on a deep warm hue when finished with urethane. Cherry wood is softer than oak, and more expensive. An extremely hard wood, very durable, which comes in both white and red varietals. Also called linden wood, basswood is a common soft wood with indistinct grains and a creamy base color. Newly popular, this Asian grass is gaining popularity as a flooring. It comes in various shades of tan, shows distinctive grain from the stalks. While bamboo takes stains well, it usually comes factory-finished. A durable and hard wood with a fine, distinctive grain. One of the softer hardwoods, with close grains and varieties of tone from whiteish-yellow to a light brown. Birch is often mistaken for maple. Like Cherry, Walnut is extremely durable and dent-resistant, with a medium color and a whorled grain pattern. Walnut is one of the more expensive hardwoods. An extremely durable and warm imported wood, Teak is usually used for out of doors applications because of its innate oiliness. From top to bottom, this list rates the hardest to the softest wood types from 1- 21, with 21 being the hardest and most durable wood, and 1 being the softest.